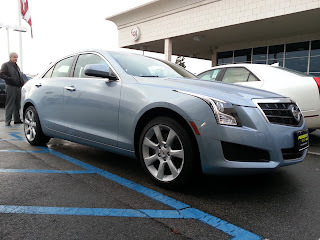 The Cadillac ATS is Cadillac’s newest entry into the mid-size sport sedan category, currently occupied by long time mid-size heavy hitters like the BMW 3 series and the Mercedes C class. Cadillac’s objective with the ATS is to compete primarily with the top seller of the mid-size sport sedan class, the BMW 3 series. The ATS 2.0T is Cadillac’s answer to BMW’s all-new 2.0L turbocharged inline-four powered 328i sedan, but can it dethrone the entry-luxury sales champ? Having never driven any Cadillac products other than a current generation CTS back in 2008, we were not sure what to expect. Cadillac's repuation for being built for the geriatric crowd loomed in the back of our minds. Our test drive of the 3.6 liter CTS back in 2008 did not help break the stereotype with its dull feeling, mushy handling, and overall dry and boring demeanor. Sure, the car looked pretty nice from the outside (we are suckers for the Art and Science design philosophy), but if that is all Cadillac has to offer, they were going to struggle to meet their goals. With the ATS, Cadillac wants to bring in a new demographic to their show rooms: the young professional. Can it draw in a younger crowd and help make Cadillac truly competitive in one of the most crowded classes in the automotive world? 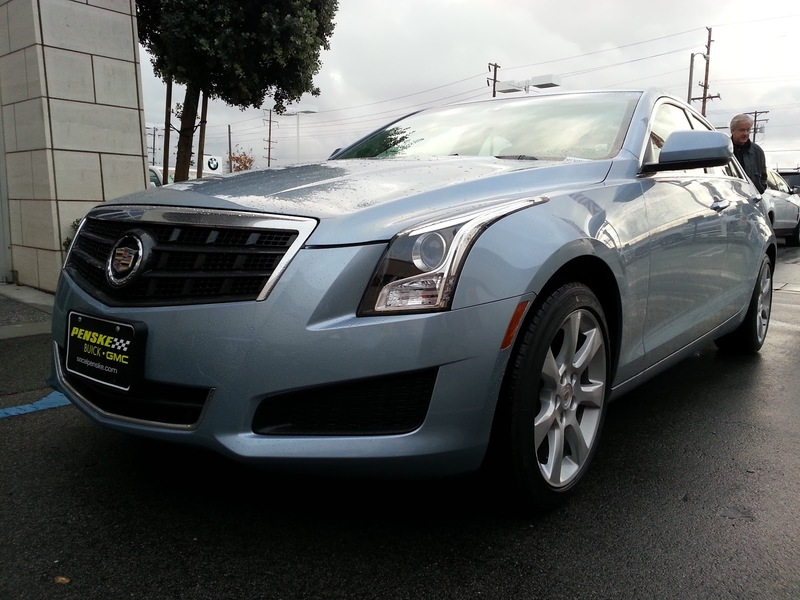 At first glance, the ATS is a very handsome car. Cadillac’s “Art and Science” design theme has created bold and aggressive looking cars with sharp creases and well flowing curves in what I feel is all the right spots. From a distance, the car looks, well-proportioned, very upscale, and very composed. Upon opening the door for the first time, the interior gives the appearance of being well-appointed and the lighting is very warm and inviting. The seats are fairly comfortable and the leather feels of a very good quality. The doors, when closed, emit a substantial “thud,” which seems to be expected of luxury vehicles in this day and age. The new “CUE” system is simple enough to operate and the capacitive buttons work well. When we sat in the back, the leg room was pleasantly adequate. Driving the car was more or less effortless. Despite being a small 2.0 liter turbo engine, there was good midrange punch once the turbo had fully spooled. Turbo lag was fairly minimal and the car accelerated smoothly, in part thanks to the automatic transmission’s smooth upshifts. Steering felt very precise and the thick rimmed steering wheel felt good in our hands, but we were not really driving fast enough to determine if the suspension was up to the task of serious handling. As a cruiser though, the Cadillac rode very smoothly and soaked up bumps reasonably well in most conditions, it is definitely slanted towards the sporty side of the equation. Of course, first impressions can be deceiving. Upon sitting in the back, first thing that caught our eye was how incredibly cheap the hard plastics looked and felt. This is supposed to be a relatively luxurious vehicle priced starting in the mid-$30k range. 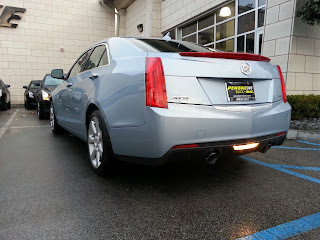 The least Cadaillc could have done was make everything look the part, if not feel it. And while the exterior looks great at a distance, examine it up close and the silver trim on the door handles and window surrounds looks hopelessly cheap and gaudy. On the info-tainment front, the new CUE system looks quite stunning with its high-resolution graphics and slick animations, but we can understand the frustration from some of the other reviews we have read. For example, after touching an icon on the screen, there is a short delay, much like when using an Apple or Android powered tablet. This is different from the instant response of pushing a button that we accustomed to in our cars, and in our “instant gratification” society, this can be frustrating having to tap multiple icons and scrolling through various menus just to access the radio. We did not get a chance to test our the voice commands, but it is probably safe to say that, like our experience with other voice-controlled info-tainment systems, this is not a suitable replacement for ease of use. The center stack itself looks nice, but can be somewhat confusing. There are no buttons to press, just capacitive touch points that control the HVAC system, radio volume, and all other systems that we are used to using buttons and dials for. Under these touch points are silver trim. At first glance, the natural reaction is to push on the silver trim, hoping that something happens, but when nothing does, it can get a little irritating.Once you find the right place to touch, there is still a slight delay before the system responds, likely in an effort to avoid having an accidental brush against center console trigger an unexpected reaction. Additionally, while there is haptic feedback, it can be difficult to locate the functions without taking your eyes off the road, making one question whether or not this type of system is really suitable for use in cars in the first place, where driving should be the main focus. NVH attenuation was decent, but whatever sound deadening GM included in this car was incapable of drowning out the somewhat rough agricultural noises coming from the engine. At cruising speeds, even on city streets, the engine note is not a pleasant one and the intake and exhaust noises are not loud enough to cover it up. Steering, while precise and well weighted, was very numb. Steering the car, one never quite gets the sense that you know what the wheels are doing, though it is a big improvement over the 3-series that we tested on the same day. However, the lack of steering feel just does not inspire the confidence one needs to push the car hard into corners, though to be fair, the car we tested was fairly stripped down and was not fitted with the adjustable suspension option, which is likely to have a pretty big impact on how well this car rides and steers. Speaking of the suspension, it was surprisingly stiff for a Cadillac. While this may be good news to some, we would suggest driving it over some uneven pavement before coming to the conclusion this is good news. As we drove over a patch of horribly maintained road, the car just failed to soak up bumps and several sharp impacts were sent through the cabin. If great steering and a plush ride cannot be attained through the same suspension design, then it is best to pick one and stick to it rather than compromising both qualities. We cannot help but wonder how things would be improved with the adjustable suspension. While the transmission upshifts very smoothly, we could not help but feel the downshifts needed some improvement. Each downshifts would seem to unsettle the car cause it to jerk a bit, with a fairly heavy lurch felt when we slowed from about 40 mph to 15 mph to approach a right hand turn. A little rev-matching in the transmission algorithm might help correct this situation. The potential for the ATS to be a major player in the mid-sized sport sedan category is there. There are some kinks that need to be worked out, but since the ATS has only been on sale for a few months, there is still time to improve. Right out of the gate, we would say the ATS is still not quite ready to take on the BMW 3-series as the reigning sport sedan champ. However, if GM continues to develop and refine the Cadillac ATS, in a few years, it has a very good chance to truly contend with the BMW 3-series, especially considering the direction that BMW seems to be going with each new 3-series. Would we buy one? Probably not at this time, or at least not just yet. That is not to say that Cadillac’s marketing campaign to draw in younger buyers has failed. We can see a lot of great qualities in the car itself and with a little polishing, Cadillac can make this into a great car. If there is one thing we can safely say, it is that Cadillac’s normal customer base will not be interested in this car as the suspension is pretty stiff and the cabin is louder than Cadillacs of yore.